These last few weeks, the Old Schoolhouse Magazine’s Review Crew has been reviewing a few different products from the Home School Adventure Co. 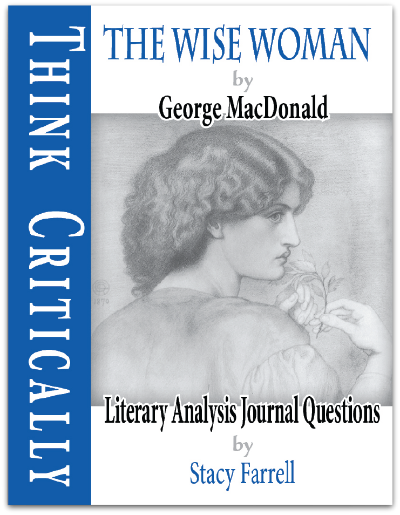 I received via PDF download The Wise Woman by George MacDonald with Literary Analysis Journal Questions by Stacy Farrell to review. The story is not written to women, but is rather about a Wise Woman and her attempts at teaching two girls wisdom and character. Both were, much due to parenting, very, very spoiled girls. Their sins were different, but both were completely unpleasant children because of the indulgences of their parents – both monetary and lifestyle. They were given everything, or told they were everything, and the child that resulted was downright awful. The story was riveting, chapters almost always ended leaving you hanging and dying to read another chapter, and then another. We passed several afternoons reading together. There are 14 chapters, each followed by 16-24 questions, and while I limited our time to one chapter often, and refused to indulge myself and read without my children and ruin the surprises of the story, we were all anxious to finish the story and find out how it ends. We used The Wise Woman as a family read aloud. I sent the PDF to my Kindle, and I read it aloud to the kids. The questions at the end sparked a discussion and often an evaluation on how well they were listening and understanding what I read. The questions weren’t the kids favorite part – one dear child requested we skip the questions! I liked them very much though, and appreciated how easy it was to evaluate my kids’ understanding and interest in the story. I read it to all of my children and asked the questions of my older four ages 5, 6, 9, and 10. Only the two oldest were truly capable of answering most of the questions with any clarity, but all of the kids, even Charlotte at age three, were asking me to read to them from the book. I was pestered by children with Kindle in hand every day, without fail. I was amazed at how well my older girls understood the book. It had my tongue twisted often, reading older English, but they followed right along (and giggled at my struggling) and comprehended much. We’ve already searched for more books by George MacDonald, loving the message presented. It wasn’t the gospel so much as personal sin, but that was very, very easy to tie into it in our discussions. The questions did include Scripture references and even memorization of applicable verses. I much appreciated all the work done for me as we analyzed the book and the story within. I usually ask my own questions when we read – but I didn’t have to with this one! It was very well done. I didn’t have the girls write their answers, choosing to discuss them aloud instead, but we’ll do this one again in the years to come, and plan on having the kids read this on their own and expound their answers on paper. The message presented, the scenario that makes a clear picture of the folly of the characters, and the questions that make you consider them all further, were excellent. The story did use language I typically avoid (ie. 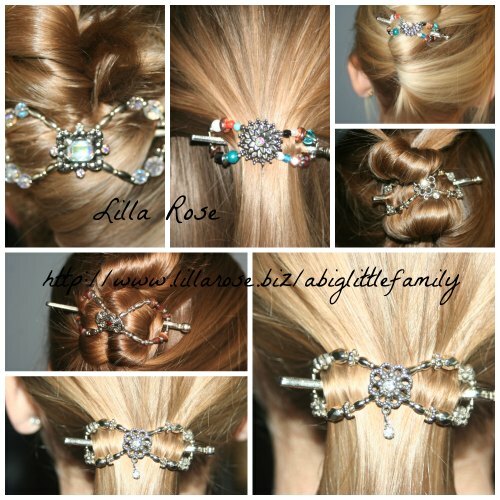 stupid) but I chose to keep it as is – although changing it wouldn’t have been difficult as I read. This is suggested as a family read aloud for children ages 9-11, to be read alone by ages 12 and up with parental help on the questions, and high schoolers could do this on their own. My girls should be able to read it on their own, I think, but the questions had us often looking back in the book to examine the story again, in order to answer the questions. I liked the way we did it, reading it aloud and talking about it together. The cost for The Wise Woman as a PDF download is $14.95. A print copy of the same book is $28.95. 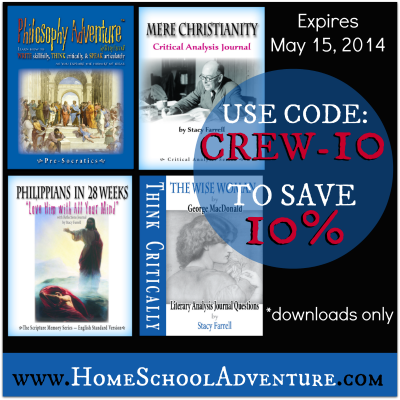 Right now, until May 15, coupon code CREW-10 will be worth a 10% discount off all download purchases. To read more reviews on The Wise Woman and the other products from Home School Adventure Co, that were reviewed by the Crew, check out the Review Crew Blog.